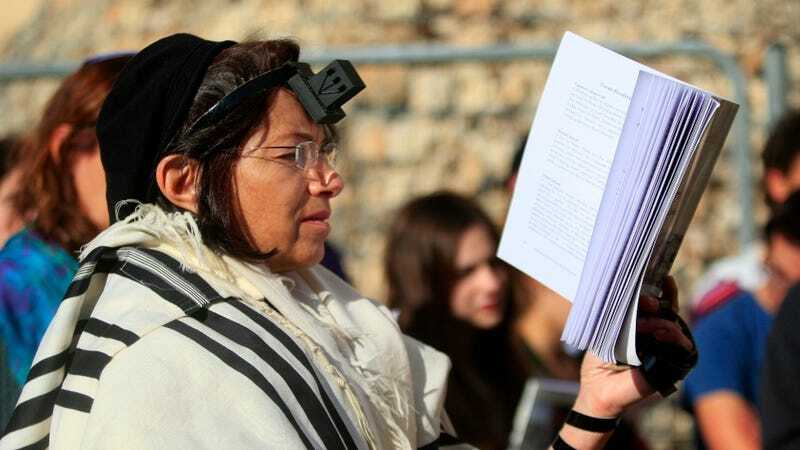 An Israeli court ruled today that women can legally pray and wear prayer shawls at Jerusalem's Western Wall, despite the best efforts of Orthodox Jews who want the holy site to remain a boy's club until the Red Sea parts once more, and probably even after that. The decision follows years of controversy, which heightened in recent months after police became fond of arresting women from the feminist group Women of the Wall for draping themselves in prayer shawls and reading aloud from the Torah alongside men. Prime Minister Benjamin Netanyahu actually had to assign Jewish Agency chairman Natan Sharansky to broker piece between the ultra-Orthodox minority and the majority of Conservative and Reform Jews around the world. ...Moshe Sobel, the presiding judge in the District Court, ruled that in its prayer service, Women of the Wall had not violated a law requiring worship according to “local custom” at Jewish holy sites. He cited previous opinions by Supreme Court justices allowing leeway in interpretation of “local custom” that would permit prayer that did not conform to Orthodox tradition. Sobel said that a Supreme Court ruling referring Women of the Wall to an alternative prayer area south of the shrine’s main plaza was a recommendation, not a legal requirement, and that the women detained this month had not posed a threat to public security that warranted their arrest or temporary ban from the site, as sought by the police. How interesting! The women "had not posed a threat to public security" by virtue of their gender. Of course, women likely won't actually be able to pray next to men. Let's not get crazy. Sharansky’s proposal "would enlarge the alternative prayer area at a southern extension of the wall, making it equal in size and access to the main plaza. The expanded area would be designated for services in which women could participate on an equal footing with men, as is customary in Reform and Conservative congregations." The Orthodox rabbi of the Western Wall, Shmuel Rabinowitz, plans to ask Israel’s attorney general to look into the "legal implications" of today's court ruling, because hell hath no fury like a man who blames tradition for perpetuating a sexist ideology. “I beg the state authorities, and the silent majority that cherishes the Western Wall, to prevent zealots on all sides from turning the Western Wall plaza into a place of internecine strife,” he said. Who is he calling a zealot?